In 1492, Columbus sailed the ocean blue… when he started his exploration of the new world! 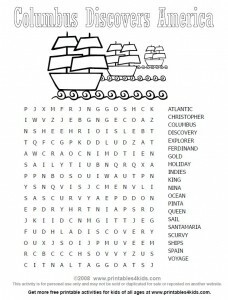 Start your own exploration by finding the 20 words we have hidden in our Columbus Day Word Search. Click on the image above to print the wordsearch full size or download the Columbus Day Word Search as a PDF file.